Landscape Designs that Function Beautifully! Plan your landscape designs now, on paper... to guarantee success! Planning will make certain you avoid costly and time-consuming mistakes. Whether you're doing yard makeovers or landscaping for a new home, planning is your key ingredient. Imagine several different views of your home landscape designs by jotting them down. See how the different rooms of your lawn or garden begin to take shape. Even better, use landscaping software that will instantly give you professional designs. You can "drag and drop" your trees, patios, garden areas into your design and print them out in minutes! Your first step in design is to measure everything in your yard. Map the dimensions of your yard, your house, distance between trees and buildings. 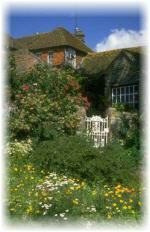 Then visualize your landscaping ideas by "drawing" your existing landscape into your software or with pencil and paper. Next, add to your design what you wish to remove. Will you take down an old shed? Are you going to keep all the trees in your yard? Once you have that on paper, then it's time for the fun part... what will your finished landscaping ideas look like? Insert flower beds, an herb garden, a charming pathway or a water garden into your design. Add a patio, garden structures, a basketball court, privacy hedges... you name it. Always consider the sunlight, shading and drainage that your lawn naturally gets. Consider all four seasons, not just the warm spring and summer months. Take care to practice proper lawn germination, seeding and maintenance. If you're planning a new lawn, be sure you prepare your lawn site properly. If you're dealing with an existing lawn, you need to know if your lawn is healthy, hungry or hopeless! All the best designs require lawn care help and renovation. Put Your Plants and Structures To Work For You! 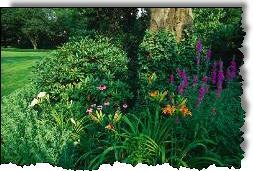 When creating landscape designs, you should work to get the most out of plants and landscape features. Arrange them to perform more than one role. For example, not only can plantings increase the beauty of a landscape, but they can provide shade, wind screens, and sight and sound barriers. Outdoor garden fountains are wonderful for adding atmosphere while blocking out unwanted noises. You can easily screen off unsightly areas, or add privacy to your landscape, by including sturdy hedges or a structure such as a garden trellis in your home design and ideas. The last step with designing is to outline a work schedule. Make sure you set up progressive steps to completion. Break up your project into manageable pieces, and arrange your schedule according to the best planting seasons. Late winter and early spring days are great for staking out beds, paths and walkways. You can lay out your patio and garden dimensions. As planting season approaches, you can buy your grass seed, flowers, or garden decor. Everything will come together because you spent time on your landscape designs.